Are you in need of a proposal for a new fire sprinkler system? Do you want an expert fire sprinkler repair technician to test or repair your existing system? Then look no further than FIRE CODE. Our company specializes in providing quality fire sprinkler system installation, service, and repair. Always delivering the best prices without sacrificing the best certified technicians and quality materials. At FIRE CODE, we offer installation of new fire sprinkler systems as well as repair of existing systems. Our experienced teams are the best in the industry for all commercial and industrial fire sprinkler systems as well as fire protection systems in residential multi-family buildings and custom homes. From design to final inspection,... we are the best! Let our experienced construction teams provide you quality installation of private fire hydrants and underground fire protection piping. From the Hot-tap of City water main to the fire hydrant or fire sprinkler system riser.... we are the best! Count on the professionals at FIRE CODE for 24 hour emergency repair service of all fire sprinkler and fire alarm problems. Our on-call 24 hour technicians offer emergency repair for all overhead and underground fire sprinkler leaks with a guaranteed 45 minute response time! Count on FIRE CODE to be there to help 24/7. We also provide Title 19 Testing and Fire Marshal Certification on all fire protection systems. 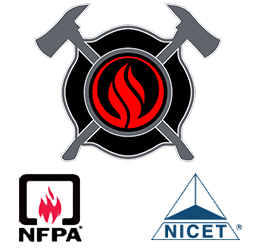 We provide safe, quality NFPA testing and maintenance of Fire Sprinkler Systems, Class I, II, & III Standpipe Systems, Fire Pump, UL 300 Kitchen Suppression Systems, Inergen, and AFFF Foam Systems - Call customer service for a quote at (888) 500-2098. Helping you bring your property up to FIRE CODE! San Diego & Riverside County Cities (619) 550-3290: (760) 851-0926: Carlsbad, Chula Vista, Coronado, Del Mar, El Cajon, Encinitas, Escondido, Imperial Beach, La Mesa, Lemon Grove, Mission Valley, National City, Oceanside, Poway, San Diego, San Marcos, Santee, Solana Beach, Vista, Banning, Beaumont, Blythe, Calimesa, Cathedral City, Coachella, Corona, Desert Hot Springs, Hemet, Indian Wells, Indio, Jurupa Valley, La Quinta, Menifee, Moreno Valley, Murrieta, Norco, Palm Desert, Palm Springs, Perris, Rancho Mirage, Riverside, Temecula, Wildomar.